If you have been hanging around baristas or coffee geeks long enough, you’ve probably heard the term “dialling in” being thrown around. In coffee talk, dialling in simply refers to the process of balancing grind size, dose weight, extraction time and output weight (or volume) to achieve a delicious tasting cup of coffee. By manipulating those four factors to dial-in your espresso, you can affect the taste and mouth feel of the coffee you produce. This simple how-to guide aims to help you get better results more consistently without getting too much into the technicalities. 1 Pull a test shot that meets the parameters listed. A good starting point is with 18g of coffee extracted to 30ml espresso within a shot time of 25-28 seconds. 2 Taste the shot. If it is sweet, balanced and delicious, congratulations! 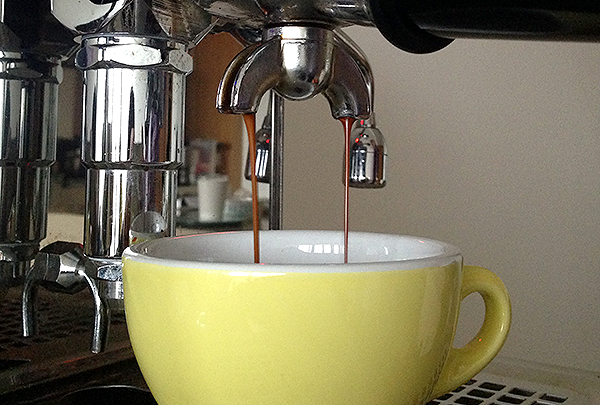 You’ve got your espresso dialled in. 3 If the shot tastes sour, adjust the grinder a little finer. If it tastes bitter, adjust the grinder slightly coarser. Once you have made the adjustments, pull another test shot. 4 If the shot time fluctuates greatly or the shot tastes off, adjust the dose and yield accordingly. Remember: a larger espresso yield can balance out sweetness while a shorter yield can help eliminate a bitter finish. 5 Continue making necessary adjustments to grind and brew ratio to taste. Target espresso yield should increase or decrease in scale with your dose. 6 Repeat the process until you get a delicious cup of coffee.